Four U.S. Inter-states I-70, I-64, I-255, I-55 and Illinois Route 3, 158, 159, and U.S. Route 50 cross the region. 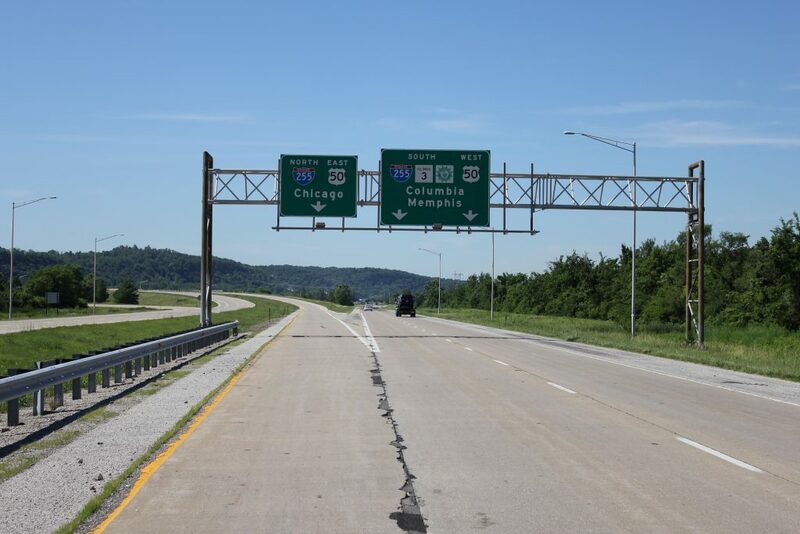 Three of the area’s four interstates reach U.S. coast lines. Interstates and roadways have low rates of congestion. In 2012 the St. Louis MSA had lowest travel time index of the 25 largest metro areas (Texas Transportation Institute). Bridges: Jefferson Barrack’s Bridge spans the Mississippi and can be accessed from all parts of the region in 10 minutes or less. The bridge carries the traffic of I-255 and U.S. Route 50 and offers truck traffic from the region additional access to I-270, and I-44. Public and Commuter Transit: Monroe-Randolph Transit District provides economical and dependable transportation to citizens of the region with curb-to-curb service to anyone in its two-county service area. MRTD vehicles can also do pickups of workers from outside the region at pre-designated points just inside the boundaries of the two counties they serve. Six of the seven class 1 railroads converge in the St. Louis region providing users with single carrier service throughout North America and opportunities to negotiate lower costs. Union Pacific St. Louis Intermodal Terminal, located in our service area in Dupo IL. offers easy access to IL-255 and IL Rte. 3. Facility has 13 originating intermodal trains per week serving Dallas, Los Angeles, and Seattle. Dupo yard also serves coal-fired facilities in Southern Illinois and Kentucky, and handles all container types, domestic and international. Kaskaskia Regional Port District (KRPD) includes Monroe, Randolph, and the southern half of St. Clair counties. As the 8th largest inland port district in the country, it includes 71 miles of river frontage on the Mississippi and 36 miles of channel on the Kaskaskia river. KRPD features an intermodal facility equipped for container on barge services (KRPD1); a new inbound off-loading facility (KRPD2), and a multipurpose, lock-free dock site (Kellogg) for down-stream bound tows. America’s Central Port is located directly below the southernmost lock on the Mississippi River allowing unhindered access to the Gulf of Mexico. The Port also offers truck, train and barge intermodal resources not found in many other U.S. Markets and a container on barge capability. Harbor movement currently includes liquid bulk, dry bulk, and a general cargo dock. Nearly 80 million tons of product are shipped through Granite City facility. St. Louis Port Authority includes 19 miles of river front with an annual throughput of 14 million tons. With multimodal connectivity and river harbor services that include dry bulk, terminal, fleeting services, general cargo dock, liquid bulk terminal, and roll-on roll -off dock. Port of Metropolitan St. Louis is 70 miles long including both sides of the Mississippi. It is the northern-most lock-and-ice-free port on the Mississippi and offers substantial fleeting operations. St. Louis Lambert International Airport is the primary airport serving the St. Louis Region with 270 daily departures to 80 domestic and international locations. Mid America St. Louis Airport is a commercial/cargo and passenger airport co-located with Scott Air Force base in Mascoutah IL serving as the secondary metropolitan commercial airport for the St. Louis Region. Features state of the art cargo support facilities for international and domestic customers. Direct connection to Lambert via St. Louis metro link passenger rail system. St. Louis Downtown Airport specializes in business aircraft as large as Boeing 739 charter flights to personal Ultralight airplanes. This Airport is the most used Illinois-based airport outside of Chicago. Spirit of St. Louis Airport located in St. Louis county is home to 500 aircraft and 2 full runways. Primarily handles smaller aircraft, charters. Will handle large aircraft with special permission of the airport administration. St. Louis Regional Airport serves a diverse clientele featuring corporate aircraft and general aviation to U.S. Military and regional aircraft makers. Illinois’ 4th largest airport.